Following a suggestion from Bob Barrows, AviPro Aircraft now offers to scratch builders a new package of wing parts. The purpose of this package is to eliminate some steps in building your wings that many builders find difficult. Finding an eight foot brake you can use and then bending up your spar webs to match your ribs can be a lengthy trial and error process - hard to get right. If the spar web heights do not closely match the ribs, your wing skins will not look so good. After more than eighty sets of wings, our factory wing team does these bends very precisely. This package includes the bent spar webs for the main spars, rear spars, false spars, aileron spars, & flap spars. Also included are the only other pieces that require bending on an eight foot brake. These are the aft wing skin stiffeners in the flap area (4 pieces) and the trailing edges for the aileron & flaps (4 pieces). This package includes all the ribs as they come from the factory that professionally hydrforms them. These are 48 nose ribs, 16 main ribs (.025), 8 main ribs (.032), 16 aileron nose ribs, 16 aileron ribs, 26 flap nose ribs, 18 flap ribs, 6 trailing edge ribs, 16 aileron pocket ribs, and the 4 false ribs. All ribs have their lightening holes cut and flanged. The ribs still need to be straightened (fluted), and have their vertical angle stiffeners riveted on. The price for this package is $2350 + shipping/handling/boxes. In an isolated corner of the Mojave Desert you will find a truly “out of this world” destination. 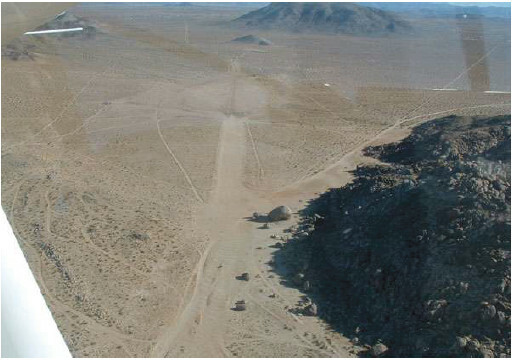 Giant Rock Airport was once the gathering place of UFO enthusiasts from around the world, and allegedly, visitors from beyond this world as well. This article is available for purchasers of 2002 Beartracks access. Click here to purchase access or validate your prior 2002 subscription. Multi-year bundles are available here.